Anyone with an appetite for a good Irish story, whether it’s from up and coming talent living in Ireland, or those with strong connections to Ireland in the UK, will enjoy a new TV show which is launching on Sky TV in May. The Irish at Home & Abroad is a brand new, hour-long magazine style TV programme which will air on Sky 212 and Freesat 161 every Thursday night commencing on May 11 at 7pm. Hosted by renowned MC, DJ and broadcaster Henry McGlade in Ireland and popular radio show presenter and broadcaster Martin Logan in the UK this show will appeal to those who like to keep in touch with the best that Ireland has to offer. “The show’s purpose is to highlight Ireland’s interests in the UK and enjoy the successes of the Irish at home and in doing so forge partnerships, develop links and draw parallels between the two communities,” explained host Henry McGlade. “There is a lot to be excited about when it comes to Irish business, culture and tourism and we aim to showcase the best that Ireland has to offer through those who are still living at home and those who have made the UK their home,” added Martin Logan. Both Henry and Martin have decades of broadcasting experience and are no strangers to the small screen. 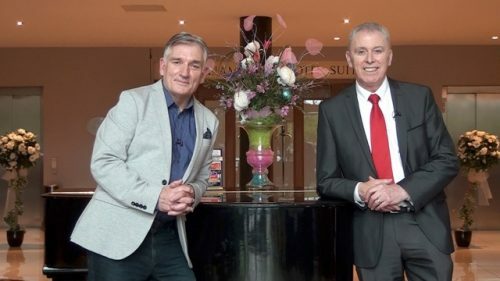 Fans of their respective programmes on Irish TV will be delighted to welcome them back and there is no doubt they will grow their loyal followings over the coming months and years with this new venture. Anyone with a story they think would be of interest to viewers of The Irish at Home & Abroad can contact the show’s producers, Frame Productions, through the shows website www.irishathomeandabroad.com or by calling 094 931 0941. The show website will follow Henry and Martin as they meander through the highways of the UK and the byways of Ireland in search of unique and diverse locations which often go unexplored. Join them on their journey which commences on Thursday, May 11 at 7pm on Sky 212 and Freesat 161.